A friend asked me about the Pachyderms and the Dove I was using in my Logo for HUP Talent and Booking. 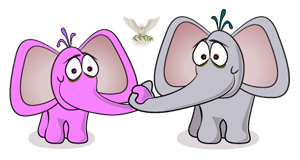 I will tell you what I told him, There is a pink or “unique” elephant and a gray “regular” elephant holding trunks and between them is a symbol of peace — the dove. I will share the meaning that it holds for me. The Spirit of Peace is a friend to all, differences can be overcome and Love conquers all. We can agree to disagree and still treat each other with dignity, Love and Respect. We can honor one another in our differences. I believe we all have more in common than not and that we can find ways to get along and allow one another to exist without excluding each other. I have chosen to work with people who are on a mission to inspire and bring HOPE and healing through their creativity. HUP Talent and Booking Agency is a SAFE Place for Artists and fellow human beings who are interested in coming up higher and working together to help change the world through their creative endeavors. It’s a place where people can freely share their God given talents and be encouraged. It’s a place of HOPE where people can be who they are and not be afraid that they will be cast out or not included because they are different. Hope Unlimited Productions Talent Agency is a place where gifted and creative people are welcomed and encouraged to shine. It is also a place for those who have been broken to be restored, refined and sent back out to fulfill their unique purpose. The Spirit of Peace is a friend to all, difference can be overcome and Love conquers all.